Rosemary's silvery-green needlelike foliage brings new dimensions to both sweet and savory dishes. Taste what happens when you add a little rosemary to a lemon cake, or when you marinate your favorite cut of meat with it and a splash of olive oil. Alternatively, add a sprig as a garnish to cocktails with grapefruit juice or lemon juice. If you choose to grow them indoors or outdoors in a container, gardeners love pruning rosemary into attractive shapes. 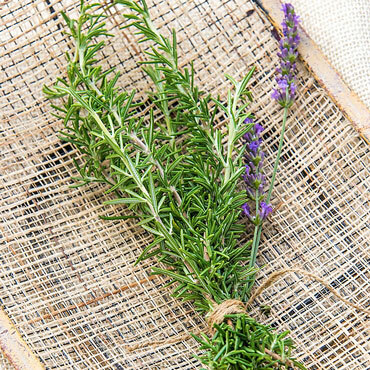 To prolong the life of your rosemary once cut, place the sprigs in our Herb Keeper, where they'll last for weeks. 85 days to maturity. Height: 60 inches in warm climates, 24 - 36 inches in the North. Zone: 8 - 10. Grown as an annual in colder zones. Depth: Seed 1/8 inch. Plants at the same level as in the pot. Germination: 15 - 20 day average, erratic, poor. Soil Preference: Alkaline, sandy soil.